C. Can I import NVivo or Atlas.ti projects into MAXQDA? 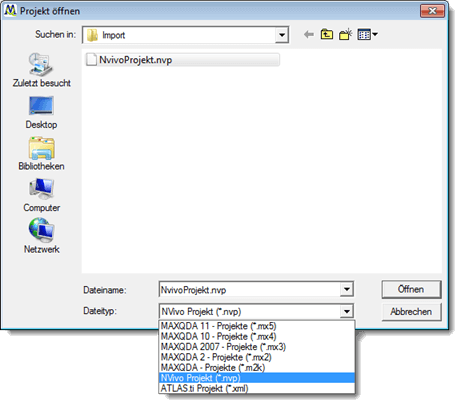 You can import projects from NVivo 8 or NVivo 9 and import projects from Atlas.ti 6 into MAXQDA 10 or MAXQDA 11 (Windows only). 1. MS Word and MS SQL Server 2008 must be installed (SQL Server 2008 is installed together with the NVivo 9 trial version and can be used without a time limit). To import NVivo 8 projects you only need SQL Server 2005, which is automatically installed with NVivo 8. 2. You have admin rights on your Windows computer. 3. The directory where the imported NVivo file will be saved, should have sufficient free space available. MAXQDA creates several temporary files during the import, which are deleted once the import is finished. To import the project, start MAXQDA 11 and select “Open existing project”. In the next file dialog, select “NVivo Project (*.nvp) from the file type menu and select the NVivo 8 or 9 project you wish to import. Export your Atlas.ti project into the XML-Format using “Extras > Export to > XML”. When prompted, select the option to “Include Primary Documents and Quotations (meta info only). In the dialog window “Send output to:” select “File” and click OK. Save the XML-File to the same folder where your HRP6 file is located. To import the project, start MAXQDA 11 and select “Open existing project”. In the next file dialog, select “ATLAS.ti project (*.xml) from the file type menu and select the XML file you exported. MAXQDA imports text documents only. This process will ignore any possible PDF documents, images or audio and video files. Atlas.ti 7 projects may also be imported, if the documents were set up as linked documents.